Long-time fans of the Golf family aren’t likely to confuse two of the most popular models in the entire VW lineup, but the price difference between them is enough to make it common for shoppers to question the differences between the 2016 Volkswagen Golf vs 2016 Volkswagen Golf GTI. The first thing you’ll notice is the slightly different styling, as the Golf GTI adds on sporty elements like its red accent strip running through the headlights and grille, while the honeycomb mesh and slatted foglights add a bit of pizzazz to the front end. Inside, the Clark Plaid seats also increase interior appeal. Looks alone wouldn’t be enough for most people to upgrade from the standard Golf to the Golf GTI, but a sportier look is a cherry on top for enthusiasts to have even more to brag about. The real prize is found under the hood, as the 2016 Volkswagen Golf GTI upgrades the engine to a potent 2.0-liter turbocharged four-cylinder engine that delivers 210 horsepower and 258 pound-feet of torque. 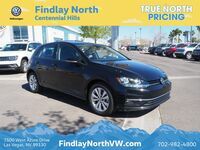 In contrast, the 2016 Volkswagen Golf offers an ample, but more practical, 1.8-liter turbo four that delivers 170 horsepower and 184 pound-feet of torque. Between the engine and the styling, it’s obvious that the GTI is a sporty take on the Golf, but this isn’t to say it’s for everyone. The price for the GTI will set shoppers back quite a bit more, and it isn’t necessary for those looking for a simple daily driver. Both models are built on the same platform and with the same body, so you’ll lose nothing when it comes to cargo and interior space for either one. Both models have a total interior volume of 116.3 cubic feet, with 22.8 cubic feet dedicated to cargo with the rear seats up, and 52.7 cubic feet of maximum cargo space. Aside from the starting price, the standard 2016 Volkswagen Golf will also save more when it comes to fuel economy since the smaller engine does sip at fuel slightly better. Over the course of a year, this won’t exactly make the Golf GTI a drain on bank accounts for any but the most frequent of commuters. It should be obvious that the main differences for the two models are going to center on performance and specs. The Golf is the practical option that normally appeals to families, commuters and those going off to college (with the Golf offering perfect cargo space for packing up for the dorms), but the GTI offers the same benefits while also being more fun for those who truly care about the driving experience. It also adds on a few more features on top of the standard 6.5-inch infotainment system, power features, cruise control, Bluetooth with audio, heated side mirrors and rearview camera also available in the standard Golf. You’ll also enjoy LED foglights, driving mode selection, 18-inch Austin alloy wheels, ambient door trim accent lighting and heated front seats. 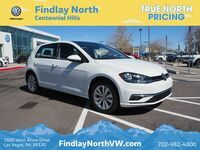 Whether the upgrade to the GTI is worthy of the extra cost is entirely dependent on how you feel behind the wheel, so drop by Findlay North Volkswagen to take both models for a test drive and compare them for yourself.